Scroll to the bottom of the page for links to mulitmodal transportation planning proposals in Greater New Haven. 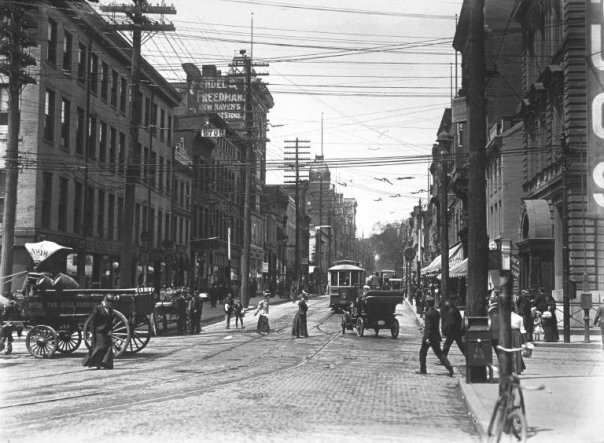 Prior to the 20th century, streets were primarily designed for pedestrians, bicyclists, and transit. In the early part of the 20th century, the automobile came into widespread use and streets became congested with all modes of transportation. 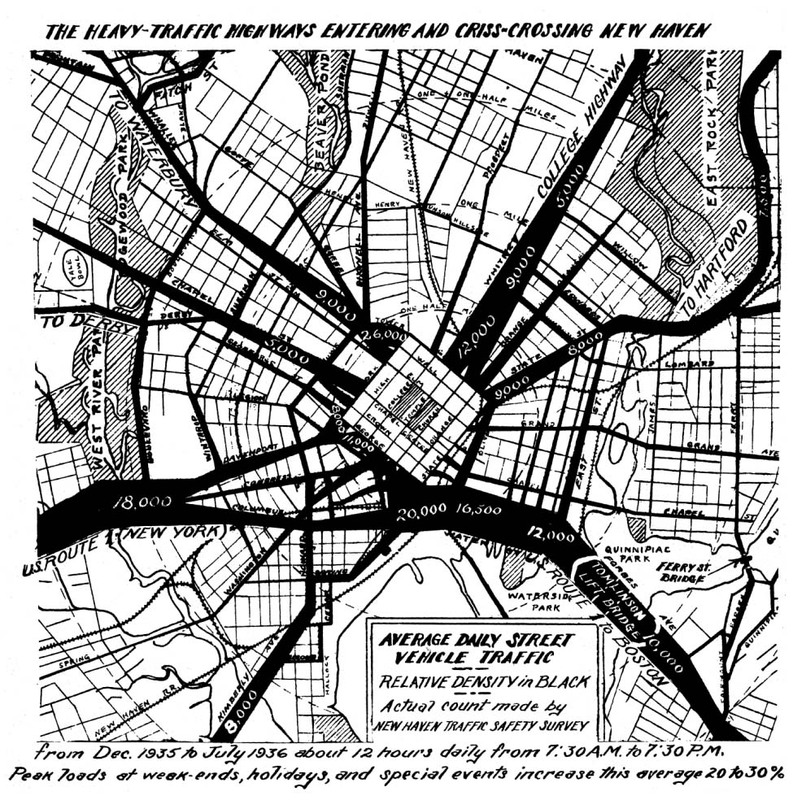 As car use increased and commercial and industrial development popped up outside of the city proper, many thoroughfares were reconfigured to accommodate automotive travel over other forms. In 1948 in New Haven, most Downtown streets were converted from two-way to one-way. Later during Urban Renewal, many other city streets were widened or redesigned to highway standards. In some cases, new roadways were created to facilitate commuting. Rather than acting as a public space or a multimodal transportation system, streets became dominated by speeding cars or traffic. Rather than being a public benefit, these streets serve as mere conduits for cars. The issues associated with an automotive dominated street system are plentiful and include increased pollution, traffic, and accidents making streets unsafe and unpleasant for all road users and adjacent land uses. Addressing these issues requires that streets be retrofitted for multimodal transportation. Strategies like road diets, on-street parking, cycle tracks, bus lanes, dedicated left hand turn lanes, and raised medians can help encourage cycling, walking, and bus riding over driving by making alternative transportation convenient and safe. In the long term, pollution, accidents, and even traffic congestion can decrease as a result of these effort. Below are a series of hypothetical proposals for multimodal transportation investments along various streets in the New Haven area. These proposals are intended to serve as recommendations for future studies. They have not been prepared in consultation with the City of New Haven, nor are the preliminary designs ready for implementation. The renderings are meant for illustrative purposes and as visualization tools. If you are interested in any of the proposals, please feel free to comment. Thank you! Does street network design affect traffic safety? Shared Space: Could Less Formal Streets Be Better for Both Pedestrians and Vehicles?